whole family to downtown Danville for the Fine Arts Faire! It will (almost) be like being in Europe for the day! With a German beer garden, Italian street painters (chalk artists), World Music being performed live along Hartz Ave., and Yours Truly providing a French "bistro" soundtrack, why would you need to go anywhere else for a day trip? Artists, sculptors, jewelry designers and other artisans from around the country will be in town displaying their creations, which will be available for you to purchase and bring home. Let your children play in the Kids Area while you shop! Top-notch food vendors will also there. 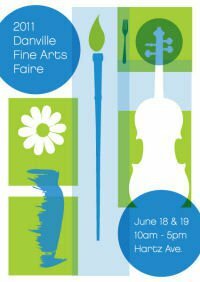 And if you're planning a future event, and are considering hiring "a positive spin" to provide your music, be sure to come by the Faire on Sunday June 19, between 10am and 5pm to meet me in person! Remember to listen for the French music ~ that's where I'll be.